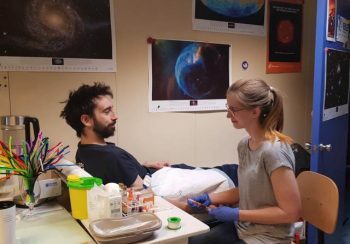 Dr. Carmen Possnig is the ESA-sponsored medical doctor spending 12 months at Concordia research station in Antarctica. She facilitates a number of experiments on the effects of isolation, light deprivation, and extreme temperatures on the human body and mind. 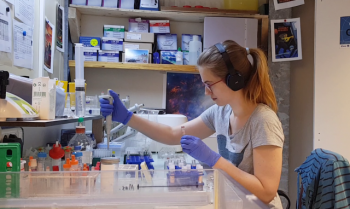 In the following post, Carmen discusses the European experiments she is performing in Antarctica. I enter the scenario into the computer and wait until my respondent has completed the preflight checks and selected a target. Then I close the curtain and my colleague is now undisturbed – with his monitors he can fully concentrate on docking to the Space Station. Then I lean back and watch the flight progress. For one of the ESA experiments my crew members fly a Soyuz capsule simulator every month. The Soyuz is the Russian spacecraft that currently brings astronauts to the International Space Station. 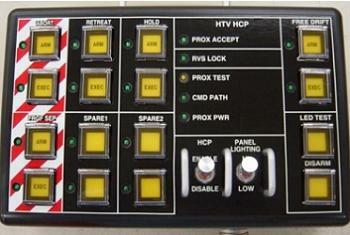 If the radar navigation system fails on its way to the Space Station, the pilots have to dock manually. If the target monitor also fails, docking must be purely visual and with the help of a periscope. If the Space Station were out of control and would move randomly through the area, this would also have to be mastered. So we have many scenarios available to test my subjects. The whole point is to find out how motor skills change in the course of isolation. Do they deteriorate, do they stay the same? In addition to the simulator, my subjects also complete motor and cognitive tests, as well as questionnaires. Astronauts on a long-duration flight to Mars, for example, may not have to steer the spaceship themselves for months. Upon arrival to the Red Planet, would they still be able to land the spacecraft and bring it back to Earth safely? After months of isolation, would they still be able to do that? How often do they need to train to perform well? Like the real Soyuz, the simulator has three monitors, one of which is the periscope viewer. 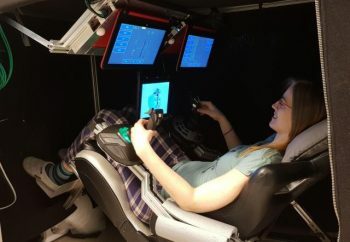 With two joysticks, one for rotational and one for translational movements, the test subject can steer the spaceship. Flying is trained for hours over the summer; now in winter I don’t give any more tips – my crewmates are on their own. Concordia is the place on Earth that has most similarities with a station on another planet, or a long-term space flight. Similar to future astronauts, we are completely isolated from the outside world – for nine months at least –, we have unusual light conditions – three and a half months night, followed by long twilight and then three and a half months sunlight –, we have to dress carefully with special clothing before we can go outside, where it is not uncommon to have -80°C and we always have to be in contact by radio; we are at 3233m altitude with very low air pressure and low humidity; we are a crew of 13 people. Lovingly we call our surroundings “White Mars”. Accordingly, the environment is optimal for human spaceflight research. I do it, and my crewmates are the test subjects. One of the other three experiments I carry out is mainly concerned with height adjustment. For this I take blood samples, urine collections every 24 hours, and various parameters like blood pressure, heart rate, temperature of the feet and hands, and oxygen saturation. In addition, there are several questionnaires. 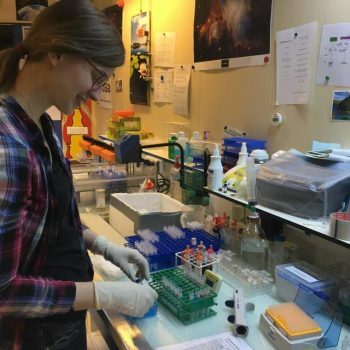 Two further experiments focus on the immune system. Since no pathogenic viruses, bacteria or fungi survive outside our station, and we are always the same thirteen people for nine months, our immune systems have no new inputs and not much to do. This is also a similar situation as it would be during a long-term spaceflight. It is therefore particularly exciting to observe what our cells say about this. I take monthly blood samples, urine collections, saliva, hair, and, especially popular, stool samples. And again many questionnaires. The immune system is a bit like a muscle: it gets stronger the more we have to use it. It is no wonder that when the first new people arrive at the beginning of summer, the winter overs get slightly sick. I analyse some of these blood samples in the laboratory. We have a flow cytometer which sorts and counts cells according to all possible values. Sometimes fast, mostly rather slow, and always quite loud. But everyone is fascinated when they can observe their cells unraveled on the screen. We also have the possibility to take complete blood pictures, and other blood values can be determined in the hospital. I regularly watch our cholesterol levels rise. The adaptation to the altitude is also clearly recognisable: my haemoglobin is currently at 15.4g/dl, after all an increase of almost 30%. We are looking forward to fleeting sporting successes when returning to normal oxygen conditions. I don’t get bored. The adventures of my colleagues in the simulator are always worth seeing, even if less and less gets lost in space. Watching our blood cells get used to the strange conditions here is no less exciting. And if the temptation gets too big, I jump into my simulator myself, let the Space Station rotate and the target monitor fail and save my spaceship with semi-elegant docking manoeuvres. At least my motor skills don’t suffer here. 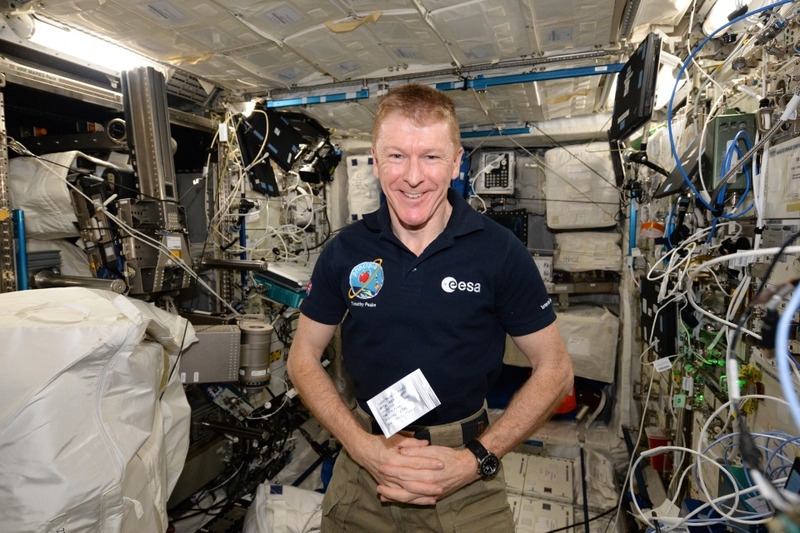 The seeds in question were flown on the International Space Station with Tim Peake and were collected from the apple tree in Isaac Newton’s mother’s orchard where Newton saw the famous apple fall, which helped him figure out the laws of gravity. Isaac Newton (born in 1643) was a physicist and mathematician who developed the principles of modern physics including the laws of gravity and motion. The tree is still flourishing at Woolsthorpe Manor, Newton’s home near Grantham, 330 years after he wrote his great work Philosophiae Naturalis Principia Mathematica, which set out the laws of gravitation on which every space mission depends. 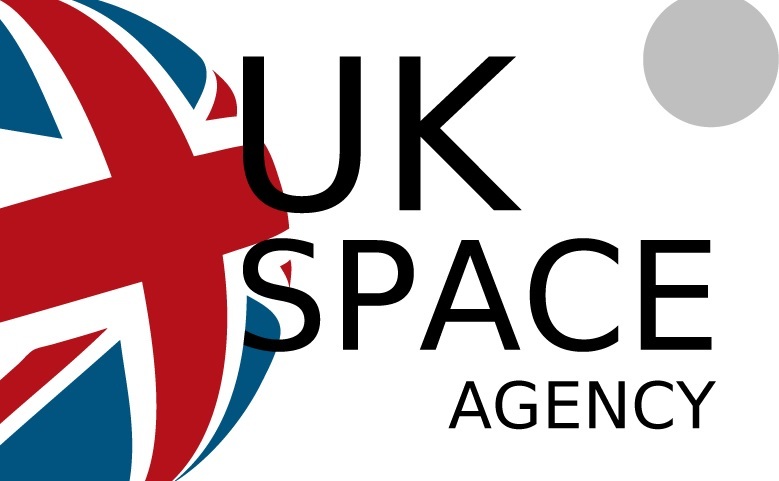 This was the great work that Tim Peake’s Principia mission was named after. 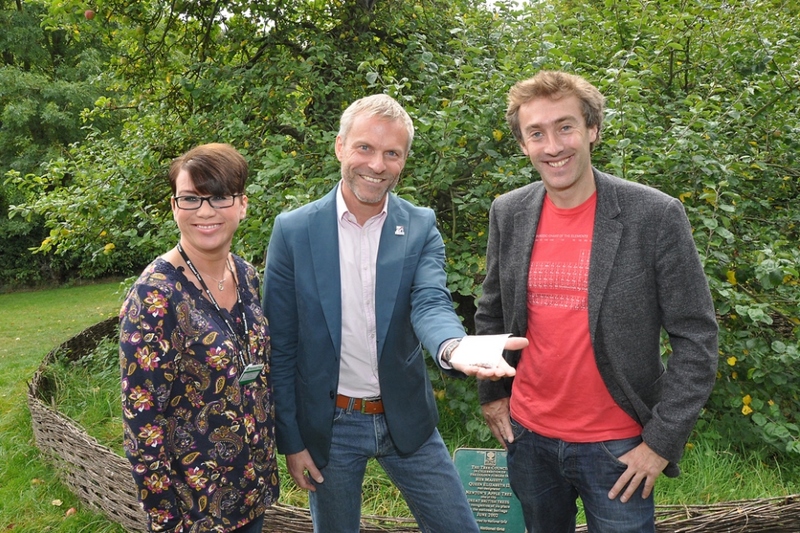 Newton’s apple tree – and the seeds being presented by Dallas Campbell and Jannette Warrener to the Agency’s Head of Education and Skills, Jeremy Curtis. 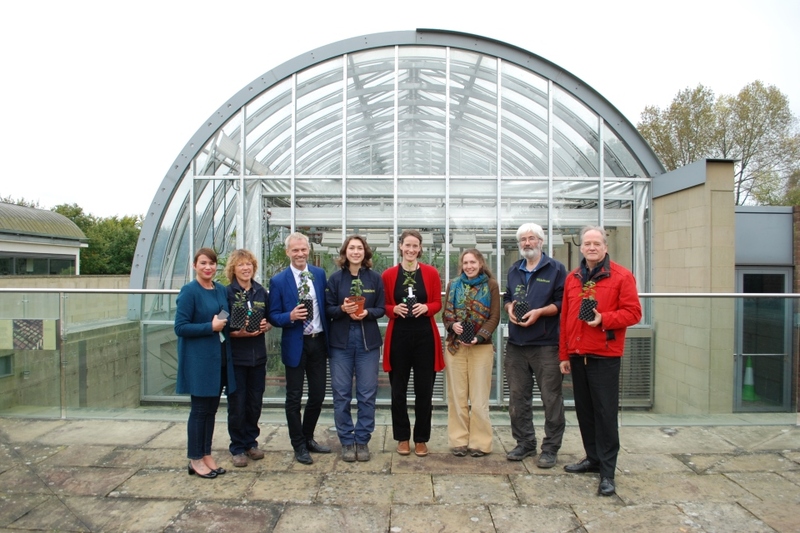 The National Trust’s Operations Manager at Woolsthorpe Manor, Jannette Warrener, and her team harvested the seeds and presented them to the UK Space Agency during Grantham’s annual Gravity Fields festival in October 2014. We then delivered them to Wakehurst Place to dry and pack them for their epic journey into space. The seeds were delivered to space in SpaceX-8, a cargo supply to the International Space Station, on the 16 April 2016 and spent 198 days in space before returning to Earth with SpaceX-9 on 26 August 2016. Tim with seeds on ISS. No image credit. On their return from space, the well-travelled seeds then went back to Wakehurst Place where they spent 90 days sitting on a bed of agar jelly at 5°C to simulate the winter cold needed to break dormancy. Spring arrived for them in May 2017 when they were warmed to 15°C and the young seedlings started to emerge. Since then they have grown fast and we now have ten healthy young plants. The Kew staff, led by Hugh Pritchard (Head of Comparative Seed Biology) and Anne Visscher (Career Development Fellow), will continue to nurture them until they are large enough to fend for themselves. The healthy young apple trees with the Kew team. From left to right: Jannette Warrener, Joanna Walmisley, Jeremy Curtis, Eliana Van Der Schraft, Anne Visscher, Cristina Blandino, David Cleeve, Hugh Pritchard. The next step will be to find suitable welcoming homes for the young trees so that they can help tell the intertwining stories of Newton, seed science and space travel. Watch this space for details of how to make your bid to host one of these precious plants. The categories menu to the right will give you an idea of what we’re currently working on and you can also join in the conversation on Twitter. Please also sign up for email alerts, delivered straight to your inbox too. The first Australian satellite in 15 years, UNSW-EC0, was successfully deployed from the International Space Station, but the UNSW engineers who built it were unable to establish contact when it made its first pass above Sydney. However, engineers say there could be many reasons for the silence and they are not overly concerned. UNSW-EC0 was ejected from the station at 3:25pm AEST, and made its first pass over Sydney at 4:21pm AEST. Engineers at UNSW’s Australian Centre for Space Engineering Research (ACSER) were unable to pick up the signal it is meant to send to confirm the cubesat is operating as designed. 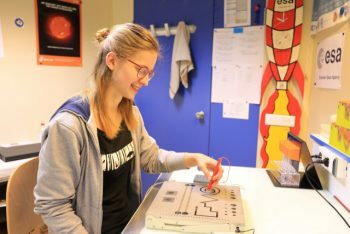 The International Space Station, or ISS, will make four more passes over Sydney on Friday 25 May, and the UNSW team of 15 researchers and students will again try to establish contact, and run a series of tests for scenarios to explain the lack of a signal. UNSW-EC0 is one of three Australian research satellites – two of them built at the UNSW – that blasted off just after on April 19 from Cape Canaveral Air Force Station in Florida. Its mission is to explore the little-understood region above Earth known as the thermosphere, study its atomic composition as well as test new robust computer chips and GPS devices developed at UNSW. In addition, its chassis is made entirely from 3D-printed thermoplastic, itself an experiment to test the reliability of using 3D-printing to manufacture satellites, making them cheaper and much more customisable. The cubesat is part of an international QB50 mission, a swarm of 36 small satellites – known as ‘cubesats’ and weighing about 1.3 kg each – that will carry out the most extensive measurements ever undertaken of the thermosphere, a region between 200 and 380 km above Earth. This poorly-studied and usually inaccessible zone of the atmosphere helps shield Earth from cosmic rays and solar radiation, and is vital for communications and weather formation. UNSW-EC0 was deployed from the ISS from a Nanoracks launcher, a ‘cannon’ that eject cubesats at a height of 380 km (the same as the ISS), allowing them to drift down to a lower orbit where they can begin their measurements. “This zone of the atmosphere is poorly understood and really hard to measure,” said Aboutanios. “It’s where much of the ultraviolet and X-ray radiation from the Sun collides with Earth, influencing our weather, generating auroras and creating hazards that can affect power grids and communications. “So it’s really important we learn a lot more about it. The QB50 cubesats will probably tell us more than we’ve ever known about the thermosphere,” he added. Denmark’s National Space Institute has now published the results, confirming many kilometre-wide blue flashes around 18 km altitude, including a pulsating blue jet reaching 40 km. This image is a still from a video recorded by Andreas as he flew over the Bay of Bengal at 28 800 km/h on the Station shows the electrical phenomena clearly – a first of its kind. 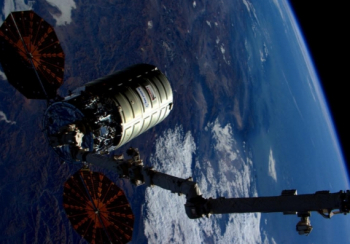 Orbital ATK’s latest Cygnus resupply ship completed rendezvous and capture operations with the International Space Station (ISS) on Sunday morning. 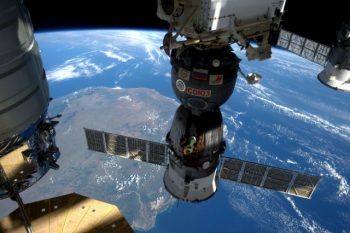 The OA-5 Cygnus – packed with equipment and supplies for the crew of the orbital outpost – had to wait her turn to arrive, allowing for the docking of the Soyuz MS-02 spacecraft on Friday. he latest Cygnus arrival is a significant milestone for the resupply needs of the ISS, having launched on the first upgraded Antares rocket. The requirement to upgrade the Antares with new engines was due to the loss of the CRS-3 mission, which failed just seconds after lift-off from the Wallops launch site two years ago. Two interim missions – OA-4 and OA-6 – were successfully launched on United Launch Alliance (ULA) Atlas V rockets, flying out of Cape Canaveral Air Force Station SLC-41 in Florida in December 2015 and March 2016, respectively. 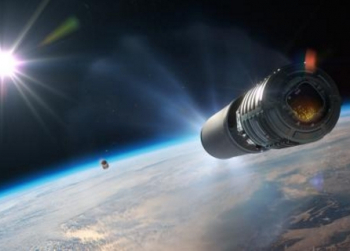 For those missions, the extended Cygnus spacecraft was pushed uphill by the Centaur upper stage. This was also the debut of the larger capacity cargo craft. During the March mission, the Centaur came to the aid of Cygnus’ orbital requirements, following a shortfall in the Atlas V booster’s performance. With Antares making her comeback from the CRS-3 failure, the OA-5 mission marked the first time this larger Cygnus will enjoy a push from Orbital ATK’s beefy upper stage. 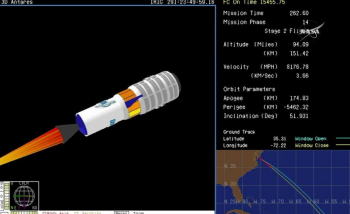 Both the new Antares 230 configuration and the Castor 30XL upper stage performed without issue, allowing Cygnus to begin her pursuit of the ISS. However, due to the timing of the mission, Cygnus had to “loiter” on orbit, waiting for the docking of Soyuz MS-02 – containing the precious cargo of three new station occupants – which was completed on Friday. While patiently waiting her turn, Orbital ATK mission controllers in Dulles, Virginia, spent the early days of Cygnus’ mission uploading and executing the first of a series of rendezvous phasing burns (called DV – Delta Velocity burns) to refine the spacecraft’s trajectory toward the Station. The first DV burn was conducted in the early phasing period. Lasting approximately 10 minutes, this was designed to raise Cygnus from its initial near-circular 230km orbit to the 400km orbit of the ISS. A similarly long DV burn followed, again to raise Cygnus to its proper orbital altitude. 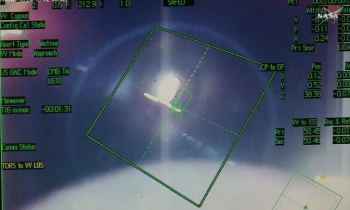 This was then followed by a planned phasing burn to align Cygnus into the exact orbital corridor of the Station. A final set of DV burns – conducted over the weekend – brought Cygnus to its “Go/No-Go for Joint-Ops” decision point, which it reached roughly five hours prior to capture. Once Cygnus received the “go” from MCC-H (Mission Control Center – Houston) for Joint Ops, Cygnus slowly approached the Station to the Joint Targeting Reference Point (JTRP), which it arrived at just over three hours prior to capture. From this point until capture and berthing, every step of the rendezvous required a strong communications link through the JEM (Japanese Experiment Module) PROX system between Cygnus, the ISS, and ground controllers. This communication structure ensured the ability to manually abort – or at least retreat – Cygnus’ approach to the Station in the event of a problem with the spacecraft or the ISS. Once at the JTRP, Cygnus stopped relative motion with the ISS and awaited a second Go/No-Go decision from MCC-H.
At this point, Cygnus was in the Joint Operations Phase (JOPS) of approach, as overviewed in documentation acquired by L2. 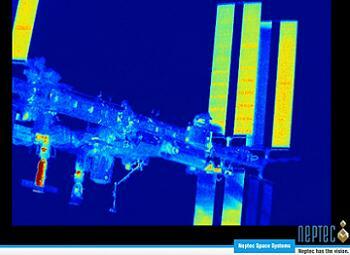 During these proximity ADV burns, Cygnus – until capture – made use of the TriDAR vision system designed by Canadian company Neptec with the support of NASA and the Canadian Space Agency. TriDAR – tested during several Space Shuttle missions – provides Cygnus controllers with real-time visual guidance for navigation, rendezvous and docking procedures. After Cygnus’ completed her first two ADV burns, the ISS maneuvered to capture attitude – a 5 minute process that took place just over two hours prior to targeted capture time. Then, MCC-H issued another Go/No-Go decision regarding two more ADV burns for Cygnus, which took the spacecraft to its 250m hold point below the ISS. MCC-H then gave the “go” for Cygnus to depart the 250m hold point and enter the Keep Out Sphere (KOS) of the ISS. Cygnus pulsed its thrusters and enter the KOS. Up until this point, Orbital ATK controllers at their facility in Dulles had full control over Cygnus. Once Cygnus entered the KOS, NASA controllers at MCC-H joined the Orbital ATK team for the tricky rendezvous and berthing of Cygnus. Just under half an hour prior to capture, Cygnus arrived at the 30m Hold Point. Five minutes later, Cygnus received the “go” to proceed to the capture point, at which time it departed the 30m Hold Point just over 15 minutes prior to capture. Cygnus then arrived at its capture point 12m from the ISS 8 minutes prior to the first capture attempt Expedition 49 astronauts Kate Rubins of NASA and Takuya Onishi of the Japan Aerospace Exploration Agency using the space station’s robotic arm to grapple Cygnus. Using the Station’s 17.5m Space Station Remote Manipulator System (SSRMS) robotic arm to grab hold of Cygnus, the capture was completed at approximately 07:28 EDT. After Cygnus was firmly in the SSRMS’s grip, robotic operations will maneuver the craft to Node-1 Unity (delivered by Space Shuttle Endeavour during the first ISS construction mission in December 1998) where the craft will be berthed at the ISS. Either later on Sunday or early on Monday, the crew will start to unpack than 5,100 pounds of science and research in support of dozens of research investigations, as well as crew supplies and hardware. This mission involves the seventh Cygnus spacecraft, designated CRS Orbital ATK 5 (OA-5). 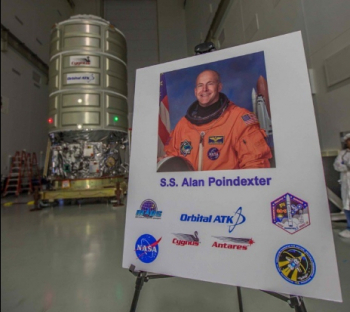 Orbital name their Cygnus spacecraft after astronauts, with OA-5 being named the SS Alan Poindexter. Born in November 1961, Poindexter served in the US Navy including as an F-14 pilot in the First Gulf War and later as a test pilot, before joining NASA in 1998. He flew aboard two Space Shuttle missions; the first as pilot of Atlantis during the STS-122 mission that delivered the Columbus module to the International Space Station in February 2008. Cygnus will remain at the space station until November 18, when the spacecraft will be used to dispose of several tons of trash during its fiery reentry into Earth’s atmosphere, and conduct the spacecraft fire experiment. At “Transformers” NASA Administrator Charles Bolden says the ISS will only last another 12 years. Orbiting 250 miles above Earth, the International Space Station is a feat of engineering and unprecedented tool for space exploration. It also isn’t going to last forever — while the main components of the space outpost were put in place in 2011, actual building began back in 1988. When asked if the ISS would have to retire, Bolden replied, “It is inevitable — it’s a human-made structure with a lifetime.” It’s year of expiration? 2028. The ISS is more likely to get taken out of space the same it was put up — deconstructed in a series of small trips. The assembly of the ISS, beginning in 1998, required 40 missions — to do this again, NASA will likely raise the orbit of the ISS to buy itself some time. NASA’s space shuttle Endeavour, retired and on exhibit in Los Angeles for the past three years, has been called back into service — or rather, parts of it have — for the benefit of the International Space Station. A NASA team working this week at the California Science Center will remove four tanks from deep inside the winged orbiter to comprise a water storage system for the space station. The reactivated artifacts are intended to help free more crew time for science operations onboard the orbiting outpost by reducing the astronauts’ involvement in refilling their water reserves. “The ISS [International Space Station] program has been steadily increasing the amount of crew time dedicated to science and technology development [onboard the station] through initiatives like the water storage system,” NASA told Endeavour’s curators at the California Science Center, according to information shared exclusively with collectSPACE.com. Reusing the orbiter’s tanks, rather than manufacturing new hardware, will “reduce the overall cost of building the water storage system,” NASA said. When space shuttle Endeavour was still flying, the same tanks were used not only to provide drinking water for the orbiter’s crew but to also fill storage bags to provide water for the space station’s crew. Similar duffle-like, soft bags are still in use today to hold the water processed through the orbiting outpost’s recycling system, which purifies the crew’s urine, perspiration and other waste water so that it is drinkable again. But refilling those bags is more time consuming than if the station were to have a more capable reserve. Endeavour’s water tanks can hold a total of 300 liters, enough for about 25 to 27 days. Each of Endeavour’s potable water tanks measures 3 feet long by 1.3 feet wide (0.9 by 0.4 m) and weighs 40 pounds empty (18 kg). Together with a single waste water tank of similar dimensions, they are located underneath the crew cabin’s lower living space called the mid-deck. Workers will enter the orbiter, which is exhibited inside the science center’s Samuel Oschin Display Pavilion, through the same hatch that was used by the astronauts to enter and exit the space shuttle before launch and after landing. The hatch is normally kept closed as the center’s visitors are not allowed to tour inside the vehicle. Using a lift to reach the hatch, the NASA workers will gain access the tanks through the mid-deck’s floor. 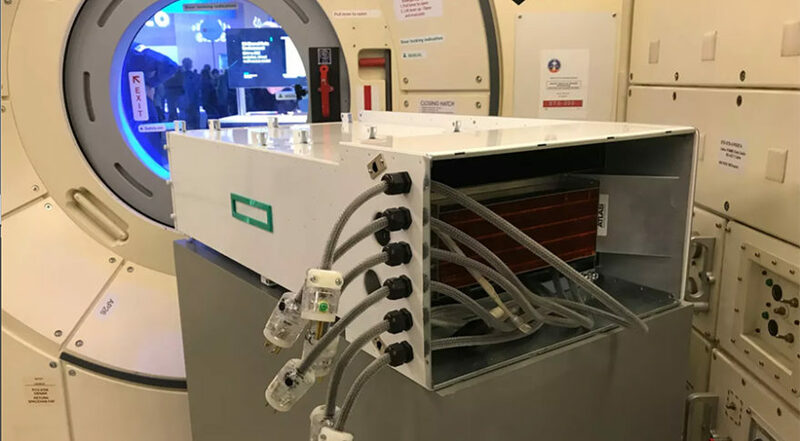 Under the seats where mission specialists sat for launch and landing is a locker that held the lithium hydroxide (LiOH) canisters used to clean the orbiter’s air of carbon dioxide. Unbolting and lifting out that container offers a pathway to drop down below the deck. From there, it is the relatively simple task of detaching the plumbing and electrical connectors that lead to each tank and unbolting the four tanks themselves from the rails that held them in place. The pavilion will remain open to science center visitors as the work completed, which is expected by Friday. The four tanks will then be shipped to the Kennedy Space Center in Florida. In 2011, at the end of its 30-year shuttle program, NASA handed over Endeavour to the California Science Center. The L.A. museum and educational complex is working to exhibit the orbiter standing upright, mounted as it was for launch with the last remaining external tank built for flight and a pair of solid rocket boosters. The exhibit, which will stand in the science center’s yet-to-be-built Samuel Oschin Air and Space Center, is expected to open in 2018. Before delivering Endeavour to California, NASA prepared the orbiter to be safe for public exhibit and removed some of its parts, like the shuttle’s three main engines, for future use with its heavy-lift rocket, the Space Launch System. But the agency needed the science center’s permission to remove the four water tanks, as the space shuttle is now the museum’s property. Space shuttle Endeavour, as currently exhibited by the California Science Center, will donate its four water tanks to support the International Space Station. It is not without precedent for NASA to retrieve its former parts from museums to support its on-going programs, but it is rare. In 2013, for example, the space agency borrowed from the Smithsonian a gas generator out of an Apollo Saturn V F-1 engine and fired up another retrieved from an F-1 engine displayed at the Marshall Space Flight Center in Alabama, in support of developing a new engine. NASA also temporarily removed parts from the prototype orbiter Enterprise, now on display at the Intrepid Sea, Air and Space Museum in New York City, to help in its tests following the loss of the space shuttle Columbia in 2003.